Navitech Gun Metal Grey Fine Point Active Stylus Pen Compatible With Android / Apple IOS / Windows 8 & 10 Tablet PC / Smartphones by Navitech at DJ Luu. MPN: activestyle. Hurry! Limited time offer. Offer valid only while supplies last. 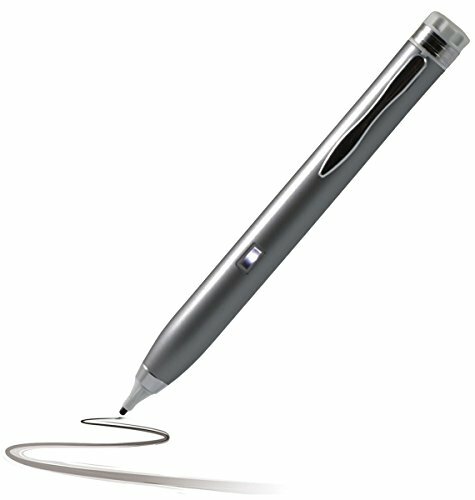 Fine Point Technology works capacitive stylus tip to be recognizes on multiple types of capacitive touch screen devices allowing for use on all devices and all operating systems. Precise Fine Point Active Stylus 2.3mm tip delivers a realistic pen-to-pad writing / drawing experience on all tablets & smartphones. Two Replacement conductive polymer nibs inside the storage compartment found on top of the pen. No Bluetooth Required, just connect included battery's and ready for use. The recommend pen for Adobe Photoshop Express / Adobe Color / Adobe Illustrator / Autodesk Sketchbook & Tayasui Sketches. If you have any questions about this product by Navitech, contact us by completing and submitting the form below. If you are looking for a specif part number, please include it with your message.